Yantras are great cosmic conductors of energy, a powerful tool for harmony, prosperity, success, good health, yoga and meditation! Yantras consist of a series of geometric patterns. The eyes and mind concentrate at the center of the yantra to achieve higher levels of consciousness. Planetary Yantras are the tools to correct the imbalance originating due planetary placements in your natal chart. It also helps you imbibe the traits supported by individual planets. There are separate yantras for the nine planets and one combined navagraha yantra. All the Yatras are energized before being shipped to invoke the embedded energy. In Vastu, each of the main planets in our solar system influences one of the eight compass directions. Each planet has a particular energy and vibration associated with it and is represented by a specific symbol called a “yantra”. Each of the Planetary Yantras below is a visual representation of a unique vibration and produces a powerful effect on the environment. The Planetary Yantras work to bring positive support and assist you in realizing your dreams. The Sun Yantra is used on a Health Altar in the east to encourage the many benefits of good health. 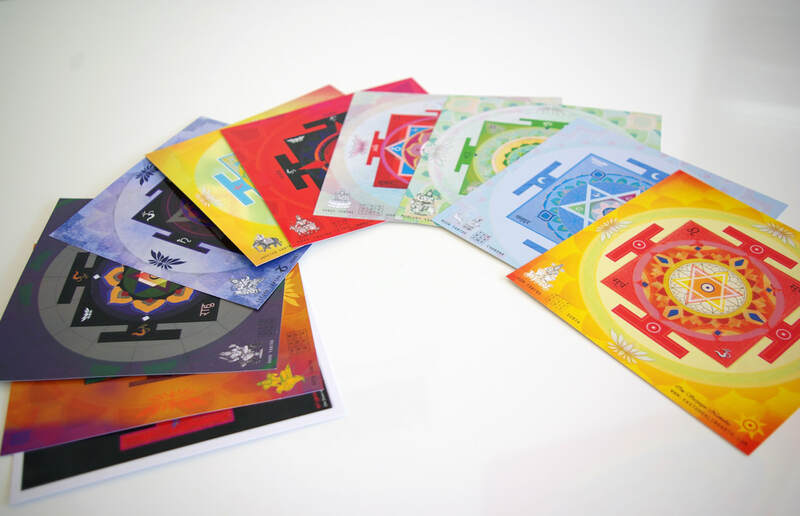 The Moon Yantra attracts relationships and creates harmony in existing relationships. Place it on your Relationship Altar in the northwest. The Mercury Yantra enlivens your abundance and can be used on an Abundance and Prosperity Altar in the north. The Venus Yantra aids in the transitions of life and is used on a Transformation Altar in the southeast. The Mars Yantra enhances career growth and belongs in the south on a Career and Recognition Altar. The Jupiter Yantra assists you in experiencing a deeper connection with the Divine. Place it on your Spirituality Altar in the northeast. The Saturn Yantra stimulates creativity and the intellect and belongs on a Creativity and Knowledge Altar in the west. Yantre 9 planeta: Sunce, Mjesec, Merkur, Venera, Mars, Jupiter, Saturn, Rahu, Ketu plus Vastu purusha mandala i Sri yantra. Print na kvalitetnom tvrđem papiru.